On October 20, 2018, there were Parliamentary Elections in Afghanistan. The election was fully funded and influenced by US-NATO to give legitimacy to their puppet regime in Kabul. Obviously, holding so-called election in an occupied country never represent the will and interest of the people of occupied country but rather it serves for the military, political and economic interests of NATO leading countries headed by US, UK, Germany and France. The current parliamentary election was held after three years delay, completely in contradiction to Afghanistan national constitution. The puppet government is not the outcome of election and votes of the people but, it is the yield of a compromise between the leading candidates of the presidential election 2014 and their foreign masters in NATO. The puppet government of Ghani-Abdullah which was created by John Kerry the US secretary of state in 2014, widely faced with the opposition from National Assembly as well the people who participated in presidential election and recognized this product of the John Kerry as an insult to their votes and will. So, the new illegal government which then named itself “the National Unity Government” to reduce the tension between the parliament and government, agreed to increase the salaries and privileges as well as extend the duration of the exiting parliament members by postponing the coming election for further three years. Through this unofficial agreement, while before most of the introduced candidates for ministries being rejected, but following this agreement, they were collectively accepted, and the level of opposition decreased. 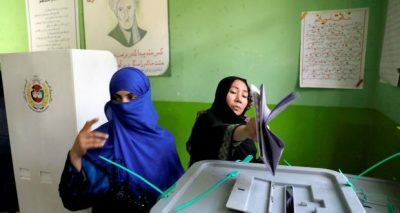 The US-NATO along with its puppet regime in Kabul held the election in circumstances where they have control on less than 60% of the territory of Afghanistan. And it means 60% of the citizens will not or cannot participate in the election. You can image that the government failed to well manage the polling station only in Kabul city where it was supposed to start the voting on 8 am but due to delay supplying of technical materials, it started 11 am and some regions 1 pm. That is why the Election Commission announced to continue the process for next day where they opened a way for potential fraud and corruption out of the sight of “independent observers”. The official report says that 12 million people are eligible to vote, but only 8.8 million of them registered for casting the ballots. A local TV reported from Badi Sayad the president of the electoral commission that only around 3 million people used their votes across the country except Ghazni and Kandahar provinces. The general distrust of the people on the election process as well as deteriorating security situation and threats by Taliban, the people totally boycotted the puppet regime election under the occupation. The absolute majority of the existing National Assembly was comprised of war lords, war criminals and human rights violators, that most of them were involved in land grabbing, kidnaping, mining extraction and smuggling, corruption and illegal contracts. Similarly, for the new parliament, the sons or family members of the existing war lords and criminal faces such as Gulbadin Hekmatyar, Rasool Sayaf, Karim Khalili, Mohammad Mohaqiq, Rashid Dustom, Burhanudin Rabani, Masoud, Qadeer, Esmailkhan, Atta Noor… nominated themselves for parliament. Most of the candidates interpret the parliament as a shop of multiple benefits where the MPs can save big amount of money, receive immunity from prosecution, enjoy military and financial power. Beside of complaints of the people, the famous war criminals and human rights violators and corrupts elements succeeded to nominate themselves. The so-calledAfghanistan Independent Human Rights Commission never dared to disclose the names of war criminals and human rights violators in Afghanistan to prevent them to rule on people repeatedly. The people believe that it is not their vote which determine the success or failure of a candidate, rather it’s the “invisible hands” that play the main role to decide on the results. Without compromise with government and criminal faces or relations with regional and Nato member countries, it is almost impossible to win the election. Because of the result of such compromises and deals, the parliament lose its credit and the government repeatedly ignores its decisions. For example, 90% of the ministers that were disqualified by the parliament, still continuing their duties. Owing to the deterioration of security situation, increase in civilian casualties and supporting of ISIS and some Taliban by “invisible hands”, there were burning debates on US- Afghan Bilateral Security Agreement which was signed by Ghani-Abdullah Government in its second day of coming on power in 2014. The MPs demanded to totally cancel the agreement or at least amend its contents. But, it was serious faced with a reaction of the government and warned, nobody is allowed to bring under question the BSA. Therefore, the story ended, and the corrupt MPs kept shut their mouths. Only in last decade, for three round presidential elections and two rounds of parliamentary election more than one billion dollars invested by US and Nato to dress their puppet regime in Kabul with the cloths of legitimacy. The current election cost more than 135 million dollars for US- Nato but for the people of Afghanistan through 193 attacks and blasts by armed opposition, 36 persons lost their lives and 127 others were injured. The people of Afghanistan have lost their hope to count on the puppet regime anymore. The US and its allies have been performing comic shows under the name of democracy and election on the ground of Afghanistan. The democracy which is taught by using of the Mother of All bombs, the democracy which is cost for Afghans both sides of the war 300 daily dead since 2001, the democracy which is fully mixed with fraud, corruption and injustice. The democracy where the last word is said by John Kerry and Nato commanders, the democracy which 60% people living in areas out of the government control and out of 12 million eligible voters only around 2 million cast their ballots!!! Until the country is occupied and from A to Z controlled by the US and NATO, no election will be legitimate. The official reports or the mass media from Kabul to Washington and Paris will drum the victory of democracy in Afghanistan but the bitter really will slaps on their faces while judging on the outcomes of this ridiculous democracy and fraudulent election in Afghanistan. Featured image is from The Irish Times.